This 2-hole O-ring file keeper, as its name suggests, is a file keeper which has two O-rings to fix the file. 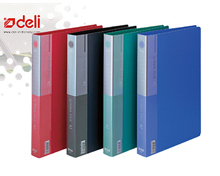 It is ideally suited for holding 2-hole A4 size documents. 1. This O-ring file keeper is made from 100% imported PP material. 2. The clamp, which is also imported from famous suppliers, is deformation resistant and comfortable to use. 3. Beautiful design of this file keeper can suit users' aesthetic requirements. 4. This product is available in various colors. As a Chinese file keeper manufacturer and supplier with over 20 years of experience, we know how to produce a quality file keeper and how to serve our global customers. As our products are reliable, economical and easy to use, they are very popular with customers in the USA, Russia, Australia, Britain, Germany, Italy, France, among others. In order to meet each of our customer's needs, we also offer a wide range of office supplies, including PP file bag, stapler, paper punch, paper trimmer, pencil sharpener, and more. If you need more detailed information, please feel free to call us or email us. » Index1. Our index is made from the imported PP material, which is reliable and environment friendly. 2. Use the innovative CPP technology, the sheets are more straight. » Ring Clip File Our ring clip file is a type of file holder which is mainly used to keep A4 paper documents. It is available in 2 holes, 3 holes, and 4 holes for customers to choose from. Our ring clip file is made from.